Throughout this long and winding trade request/not-request saga, Orlando Magic superstar Dwight Howard has made it very clear that, if he does change teams, he wants to join a championship contender, (or a team like the Nets, who would theoretically become a championship contender if DH teamed with Deron Williams). He has no interest in building a contender from the ground up or joining a mediocre supporting cast like the one currently in Orlando. It will be an instant success or nothing at all. 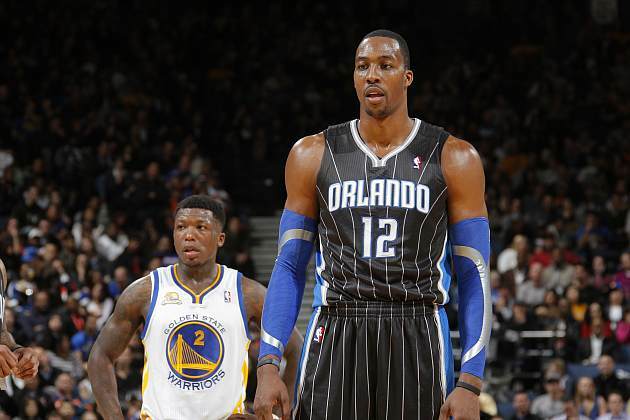 Warriors continuing push for Dwight Howard deal even without DH commitment to re-signing. Not backing off from risky move, source says. Biedrins has zero trade value, so GSW offer has to be 3-4 key pieces. Imagine moving Monta, Klay, others and DH walks. But Dubs staying in. The Warriors' gambit is quite questionable, in that they assume that Howard will like playing with a depleted GSW roster in the Bay Area so much that he changes his mind about the franchise and commits himself long-term. There's little evidence for that outcome, of course, and it could be seen as a case of reckless optimism more than outside-the-box business sense. The new ownership group headed by Joe Lacob has been looking to make a splash for some time, and this trade would certainly qualify. Whether or not it's smart is another question entirely. And yet, it might not be the worst decision possible, even if unintentionally so. If they're able to swing a trade, then they'll have their opportunity to convince a star that Oakland is the best home for him long-term. If they can't do a deal, then players who have already been mentioned in plenty of trade rumors over the next year won't find themselves in a particularly new situation. The key question is what would happen if a Howard deal somehow happened and he then left in free agency. Oddly enough, a gutted Warriors team built around Steph Curry or Monta Ellis and few others wouldn't be the worst situation for the club moving forward. In the modern NBA, being terrible is much better than being mediocre because it helps a team get a high draft pick that they can then use to select a potential game-changing star. For the better part of two decades, the Warriors have been locked in a perpetual middle ground between the high lottery and the playoffs, one where they collect middling draft picks that yield role players who can't wrench them from their place in the middle of the league. Being awful for a year or two would help them reload in a way that could actually build towards something other than irrelevance. By taking a few steps back and accepting short-term failure, the Warriors could finally move forward.